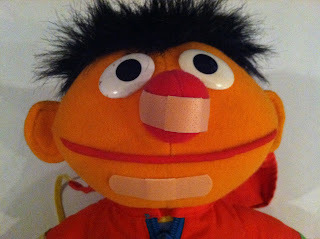 Ernie is walking (or running or jumping or flying or dancing) and he falls (or trips or slips or tumbles). He hurt his nose (or knee or hand or forehead). What happened? Why is he crying? Where does it hurt? Where will you put the band-aid? Do you need a big band-aid or a little band-aid? This was one of my favorite lessons when talking about body parts and all that was needed was a doll and a box of band-aids. Label body parts and actions, use appropriate verb tense, answer questions, increase utterance length, and turn taking are some of the objectives that could be covered during this activity. A note of caution - I did have one student who was sensitive to latex so she used a plastic band-aid from an old Fisher - Price doctor's bag. However, latex free band-aids can be found at most pharmacies. Next Post: Part II - Make your own band-aid book. What a great idea! Defiantly adding this one to my "toolbox"!